Me:Tell me something about your life, educational background, and style. When and why did you become interested in fashion? Unnur Fridriksdottir: Since I was very young, I drew clothes, knitted and made accessories. I come from a very artistic family. My sister is a musician, one of my brothers is an architect while the other is a philosopher and a painter. My parents are both very creative, and have always been extremely supportive to me. I studied natural sciences in College, art history and fine arts and did tons of acting while I was in school – but only to realize that fashion is were I excel, so that’s what I got my BA in and decided to make a professional career of. The use of fish in handbags and accessories isn’t really common. Why sea leather? How did the idea of working with sea-leather occur to you? In reality, it was the day where I fell upon the sublime ﬁsh skins of the most unlikely colors that I got the idea. It clicked. It was about 15 years ago, I had found a summer job in a ﬁsh-factory. I saw the fashion potential right away. I looked into the feasibility of using the fish as traditional leather and created some prototypes. It’s only a few years later while studying fashion design in Europe that I heard about a tannery transforming the ﬁsh skins into usable sea-leather. I contacted them right away. Soon after, we prototyped a collection of bags made from sea leather. Today, I create quality pieces that will be passed on from mother to daughter. Sea-leather ages amazingly! Where and how are the items produced? All the bags and accessories are made by hand in the USA, but the raw materials mainly come from Europe (the leather and sea-leather). Skilled professionals do each step of the way, although there has never been an item shipped out which I haven’t touched and worked on myself in some way. How is working with fish special or challenging and what happens with the fish, after its skin has been used to make handbags and accessories? I know that hearing the word “sea-leather” sounds new – so I want to emphasize that sea-leather smells like regular leather, just like any other exotic leather; ostrich, crocodile or snake. Working with sea-leather is very challenging to work with as a material due to the size and shape of it. It can be a bit of a puzzle. The beauty of it though, is that each piece is different from another, thus every item is unique. The way that the sea-leather I work with is tanned it shimmers rays of colors which can not be found in any other material that I’ve ever worked with or seen. The more the sea-leather gets worn, the better it looks. The fish is all used for consumption – none is wasted. 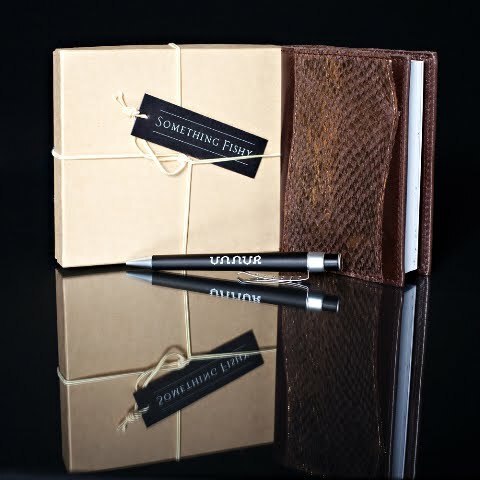 In using sea-leather UNNURWEAR is contributing to sustainable fashion, and not endangering any species. There is nothing fishy about that! What kind of men or women would buy from Unnurwear? Women and men of all ages from all over the planet are fans of the UNNUR brand. I think the collection has been so broad from the beginning that men and women can find the best bag to fit their personality and needs. I’d like to think of all the customers as adventurous, worldly, very cool and unique human beings. Some of the accessories and handbags have women’s names like Elisabet, Elena or Kristin. Is there a reason behind that? The products I create are very personal in the way they are named, and all the names have real meanings behind them. Each item carries a name of a “Viking or a Valkyrie” in my family, and are names of real people. What new experiments would you like to try with your designing besides sea-leather? I’ve designed women’s wear for as long as I can remember as well as jewelry. 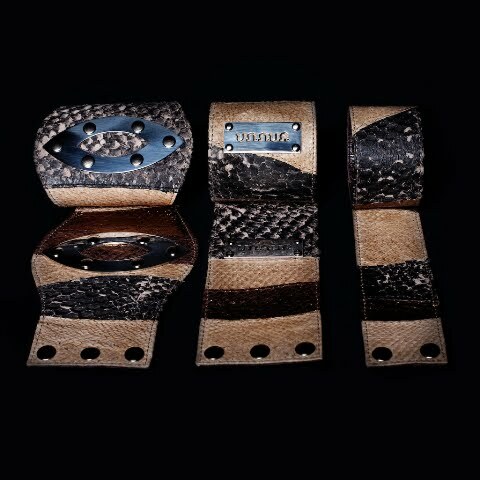 At the moment, my collection consists of bracelets, belts, journals and handbags, for both women and men. My custom made clothes and one of a kind jewelry are only available upon request, but can be seen in all our ad campaigns. How is designing menswear challenging? Is it really different from women’s wear? Where do you get your inspiration? I’m constantly pushing my boundaries as a designer. The challenge of going from one gender based design to another, is to get into the complete masculinity and the needs and functions for a male – vs the feminine thinking and needs. The functionality of the gender based items that you are more familiar with as a designer is often easier to work with. The men’s collection is absolutely amazing, and very functional. The inspiration for the men’s collection were a collage of my most favorite males, their attitudes and their ways of going about their days. What would you be if you weren’t a fashion designer? Art, music and of course fashion is something that I love. I love fashion because it’s about “every day theatre” where we humans can play and dress as the characters we want to be on daily basis. That’s what I love the most about fashion. I guess if I weren’t in fashion I’d be fascinated be theatre – and be an actress. Lately I’ve obsessed with lights of all kinds, and am very interested in exploring the design of lights further – who knows, perhaps I would have been a lighting designer? What are you working on? What is the ultimate goal you wish to achieve? New and exciting products! We just launched a beautiful mini clutch, STINA, which many of our clients use as a cosmetic bag to match their larger bags, and then we also launched an incredible tote, KRISTIN, which can be worn in many different ways. My ultimate and every day goal is to be happy, stay healthy and to become a better human being. How would you describe your philosophy about the art of fashion? Fashion for me is about “every day real life theatre”. It is a bridge between ancient rules of craftsmanship (patternmaking, draping, beading, tailoring) and technology (new fibers, graphics etc) – all that mixed with the character of your multifaceted personality that you wish to expose and express each and every day. It can be total freedom or completely restrained - the quickest way of giving your audience an illusion of who you are, or want to become – anything and everything is possible. If you're dying to get your hands on one of those fishy bags, don't think it twice and visit their Online store now because they have free worldwide shipping on all of their bags. Become a fan of UNNUR on FaceBook and you can receive exclusive offers and information. I also want to thank Unnur Fridriksdottir and the team of Unnurwear for making this possible. Wow! Incredible and amazing - I think all the hand bags look wonderful and amazing! My favorite one is the Kristin bag, so exciting - thank you for this stunning post! That's different. Cool, though, and I like the interview. Beautiful bags! I am very comforted to know they don't actually smell of fish!! I love the shiny leathery texture and the platin blonde models. Edgy pictures to inspire and to make want more. The way she uses her cultural heritage is awesome too. Great interview! Thanks for sharing... I like the fact she's explored sea leather as a new way of sustainable fashion. I've seen some sea leather before and they do look surprisingly like 'normal' exotic skin leather. Fabulous interview! I've had a look at the bags and think they are gorgeous! I also love the concept of sea leather. I just looked over the www.unnur.com/onlinestore and I all I can say about it is just georgous... these bags have made my day... Thank you so much! I loved reading this interview. What a brilliant idea, that I never really knew anything about! Awesome. I didn't know about sea-leather. That is really cool! She is wonderful. thanks for introducing us to her work. I had never heard of her. Her designs are amazing! Wow..this interview was so interesting!!!! 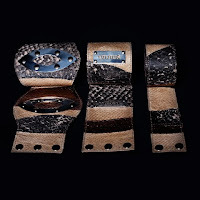 I love scaly, serpent-like things so I love the sound of leather goods made from "sea leather." What gems! I would love to have one of these pieces! Just arrived on your blog! Really amazing! would you like to come and see my blog IRENE'S CLOSET? Great interview and such amazing style! A girl, her dreams, and her pasion for fashion. Follow me and keep track of my new posts! Get the latest news. Subscribe! Earth Day with Earth Mother. What do you thing about this blog? DISCLAIMER: THE PHOTOS DO NOT BELONG TO me, EXCEPT THE ONES I PERSONALLY SHOT.